Before Friday morning, University of Texas of the Permian Basin’s football program consisted of 1 helmet, 3 footballs and an eye on 2016. The Falcons now have a coach as well. Justin Carrigan was officially announced as the school’s first ever head football coach at a press conference early Friday morning. 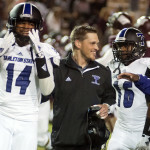 Carrigan previously served as the offensive coordinator of the high-powered Tarleton State University football team. While this will be his first head coaching gig, UTPB’s Athletic Director Steve Aicinena feels very confident in Carrigan’s future with the program. Aicinena felt that the familiarity with the LSC, both teams and coaches, as well as Texas high school coaches are what really separated him from the other two finalists. “It might take 2 or 3 years for someone who was not familiar with the state to build relationships and make the contacts for recruiting that Carrigan already has. We felt like we had three very, very good candidates. He just stood out more than the other two. I think we got it right,” Aicinena said. Lindsey Wilson University Head Coach Chris Oliver and Dale Carlson, the former head coach of Valparaiso, were the other two finalists. 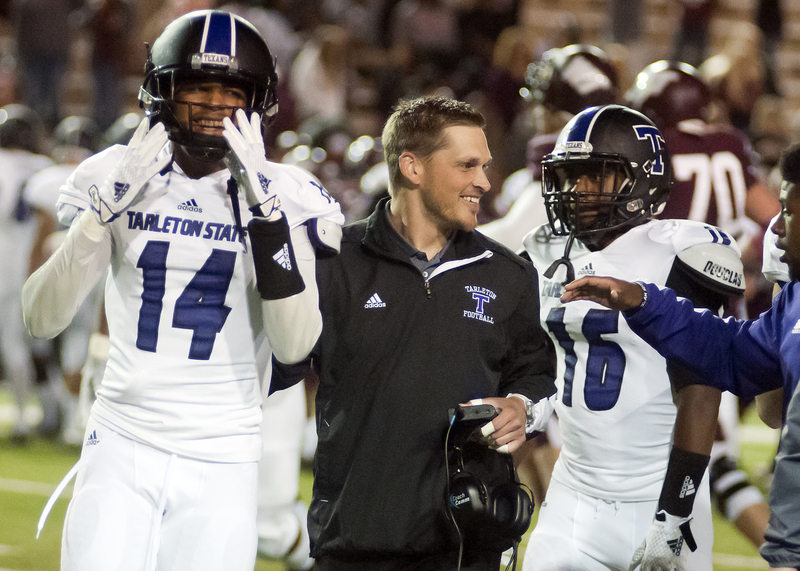 Carrigan has spent the last five seasons with Tarleton State, and the last three as the offensive coordinator. According to his Tarleton Sports profile, during his time with the Texans, the offense has steadily improved statistically every season with the total offensive yards growing from 3,573 in 2010 to 5,228 yards in 2014. 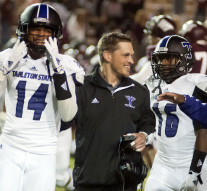 This past season was one of the prolific offensive seasons in the history of TSU football. The Texans ran for 2,220 yards, threw for another 3,008 more, and scored 437 points for an average of 43.7 points per game. UTPB will not compete in 2015, as they still have a stadium to design and build, 30-plus staff members to hire and most importantly players to recruit. Before his coaching stint with the Texans, Carrigan served one season with University of Texas – El Paso, and four seasons with Midwestern State. He graduated with his Bachelor’s degree in 2003 from Angelo State, where he was a two-time All-LSC safety. In 2009, Carrigan received his Master’s degree in Sports Administration while at Midwestern State.